The Fort of Dundlod was built in the 17th century by the Shekhawats, who ruled the province at that point in time. 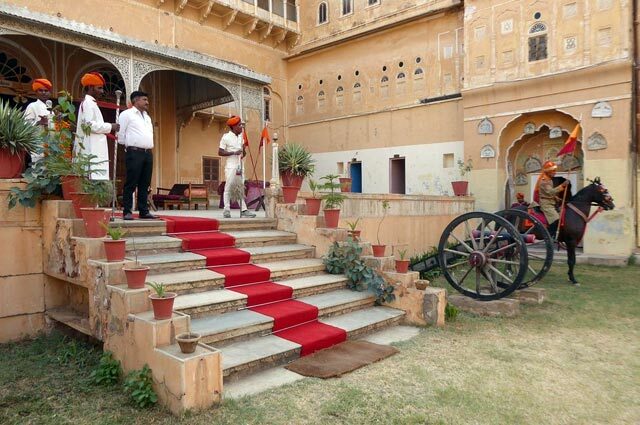 Since then, the fort has been renovated and converted into a heritage hotel that offers guests a firsthand experience of regal lifestyle and a glimpse of rich cultural heritage of Dundlod region. 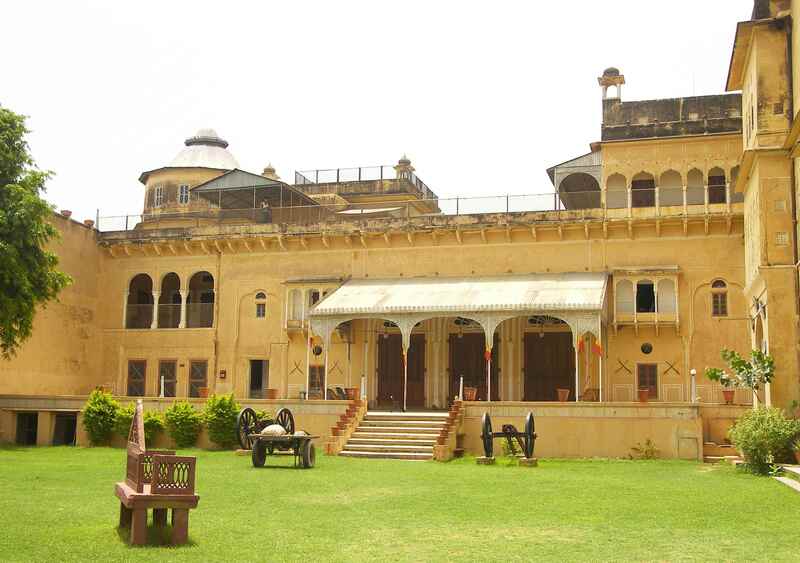 The fort is built in typical Rajputana-Shekhawati style and resembles a palace. The palatial structure is surrounded by deserted natural beauty all around and makes for a perfect tranquil holiday destination. 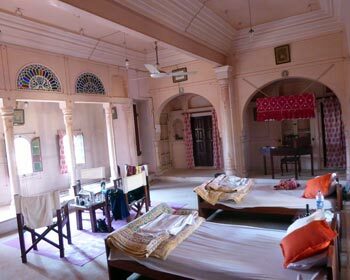 Patrons who are willing to experience the rich Indian past are offered accommodation in Deluxe Rooms and Royal Suites, which are restored to their glory and modernized by incorporating current day comforts and facilities. 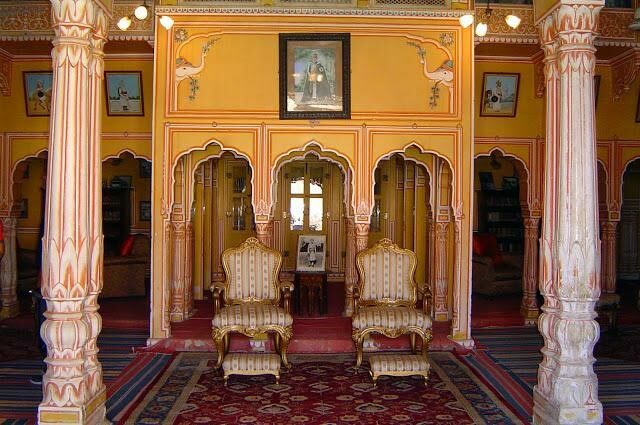 The décor of the whole fort is very opulent and is ornamented with antique furniture, wall hangings, foliage, minarets, mythological paintings, and artistic weaponry. To offer a glance at the culinary practices of golden India, the heritage hotel has developed an in house restaurant that serves Indian, Continental and Chinese cuisines along with delectable local cuisine. The local dishes are something worth trying because of their unique taste and mesmerizing aroma. Moreover, the hotel has also developed other tourist friendly facilities to make guests feel pampered during their stay at Fort Dundlod. These include express laundry service, doctor on call facility, cultural evenings with local folk artists and musicians, horse safari, sightseeing facility, car and taxi hire service and many others. If luxury and comfort are the factors that decide the basis of a convenient accommodation choice, then the Deluxe rooms available at Heritage hotel Dundlod Fort are ideal for you. 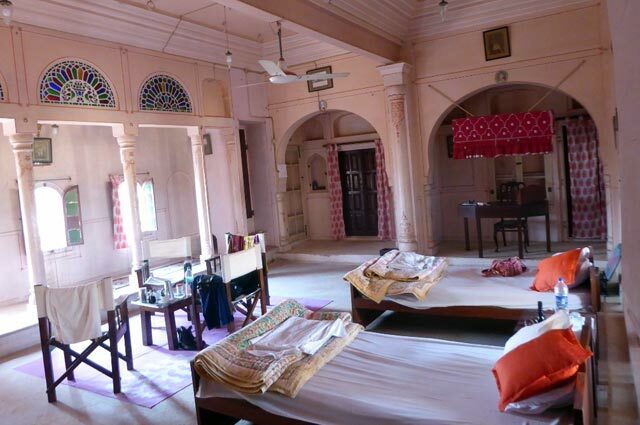 These rooms are part of the original fort complex that has palatial structure and regal style. 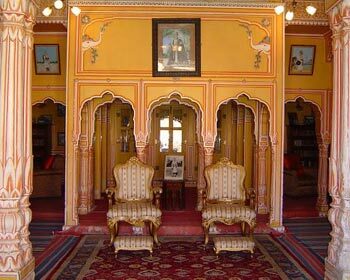 The architecture resembles the old ‘mahal’ with Rajputana and Shekhawati art work adorning its ceilings and wall. In line with the heritage theme of the hotel, the rooms are given opulent interiors that are decorated with local embellishments and artifacts. Furnished with premium furnishings like antique furniture, wall hangings and artistic weaponry; the rooms sport very regal vintage charm that is sure to impress patrons. Even though these rooms look old styled, they are renovated to incorporate all modern day amenities and features. These include private bathroom, hot and cold running water availability, comfortable antique bed, rustic sofa unit, heritage desk and chair, television set with premium channels, direct dial telephone lines and round the clock room service. The regal setting and heritage structure of Deluxe room make staying here once in a lifetime experience for guests. If space is what matters to you the most, and you want to experience the Indian regal hospitality, then opt for Suites as your accommodation option. The Suites are the part of the original fort that was built in 17th century and has been renovated to transform it into a heritage hotel. Designed very carefully in a way that it retains the old world charm and regal opulent aura, the suites have very classy interiors. The décor of Royal Suites is ornamented with foliage, minarets,archaic furniture, mythological paintings, artistic weaponry and other embellishments. The structure sports intricate work that is done in Shekhawati style and gives the glimpse of rich cultural heritage of the Dundlod region. The Suites are equipped with modern day amenities to ensure that patrons are comfortable during their stay here. These include private bathroom, hot and cold running water availability, comfortable antique bed, rustic sofa unit, heritage desk and chair, television set with premium channels, direct dial telephone lines and round the clock room service. If you an adventurous foodie and keen to try unique flavors in exciting settings, then the in house restaurant at the heritage hotel Dundlod Fort will surely impress you. The eatery is located on the rooftop of this palatial structure and offers mesmerizing view of the surrounding natural beauty. The experience of savoring your favorite delicacies under a clear starry sky is very unique and memorable. In line with the thrilling ambience and exciting setting, the food served here is also very unique with flavors from popular cuisines across the globe. Patrons are served best of Indian, Chinese and Continental dishes along with host of local delicacies. The local delicacies are unique to the Rajasthani culture and are prepared as per traditional recipes that give them unique flavor. The rustic setting and delectable food make dining here a very special experience. Enjoy your favorite drinks and get in the spirit to enjoy the majestic surroundings of Fort Dundlod at the in house Bar. The Bar is a traditional Raj Buggy that carries drinks around the restaurant in a regal style. Patrons are served the best of Indian and imported sprits that include popular wines, single malts, scotch and beers. Apart from this, patrons can also go for cocktails, mocktails and even non alcoholic drinks that are served here. On the menu, guests will find an assortment of snacks and finger food which they can choose to complement their food.